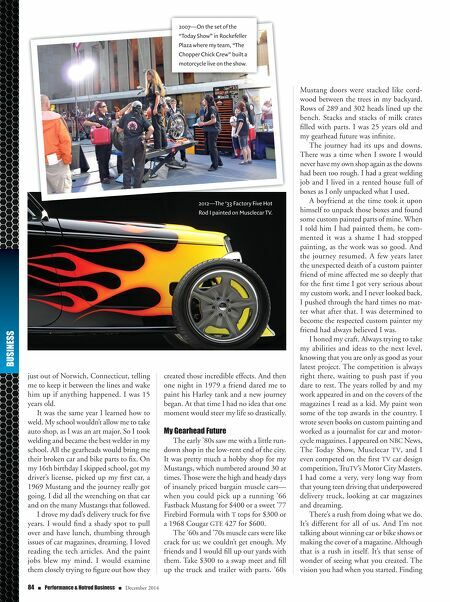 December 2014 n Performance & Hotrod Business n 85 the path to make it become reality. And those brutal hard moments along the way: those 3 a.m. nights, when everything goes wrong and the odds are all against you finishing the project on time, then stand- ing back, taking it all in. The buzz as you realize you did it. You made it happen. Marveling at the miracle you produced. It's knowing what you created. And that's what I felt on the latest 3 a.m. night. I was in love with my latest project. And it didn't matter what anyone else thought. I loved it. And that's one reason why I do it. The Woman Dressed in Black Leather But something that happened to me nine years ago is an example of the other reason. Due to our professions, we end up in places and have experiences that are so very unique. Experiences that shape the character of the people we become. I was coming home from a car/bike show in Atlanta. I had ridden my 1989 1200 Sportster cross country to the show, not taking the Interstates. On the ride home a storm had rolled in and was chasing me across the backcountry of South Carolina. If I slowed down, the rain would start hitting me, so I kept on the throttle, just enjoying the rush of this ride. I had put some distance between me and the black clouds that filled the western sky and pulled into a fast food restaurant to eat and take a break. After sitting down, I noticed a group of very elderly women were staring at me. Were they judging me, the woman all dressed in black leather on the motorcycle? Finally one of them came over to me. "I just wanted to say how wonderful we think you are," she said excitedly. "We saw you ride in out of that storm. It must be so exciting to live like that!" We all talked a little more as the storm drew closer. I said my goodbyes and got on the Sportster and made it out onto the road resuming the race between me and the rain. I had become that person on the motorcycle on the Bissel Bridge I had seen all those years ago. It's been an incredible journey, one that has taken me places I could not have dreamed of. None of which would have happened if I had not chosen a career in the custom world. JoAnn Bortles is an award win- ning custom painter, airbrush artist, welder/fabricator, tech writer, and photojournalist with over 30 years of experience in the automotive industry. She is the author of seven books on automotive, motor- cycle, and custom painting. 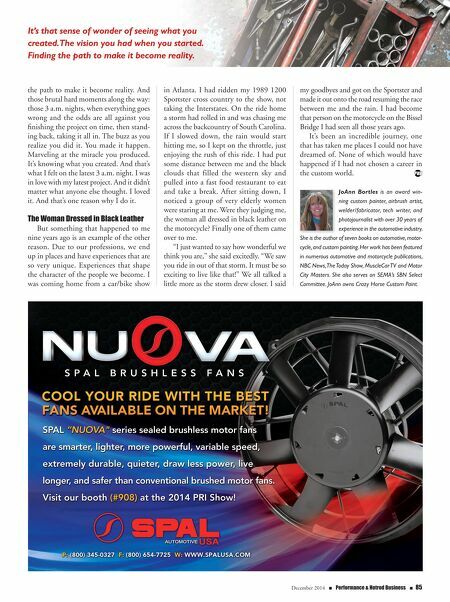 Her work has been featured in numerous automotive and motorcycle publications, NBC News, The Today Show, MuscleCar TV and Motor City Masters. She also serves on SEMA's SBN Select Committee. JoAnn owns Crazy Horse Custom Paint. It's that sense of wonder of seeing what you created. The vision you had when you started. Finding the path to make it become reality.